True sphérique, established in 1998, is a non-governmental organization for contemporary arts and culture in Zilina, Slovakia. The association organises 300 events in the three venues that it runs: Stanica. New synagogue and S2. In total, more than 30 000 visitors attend the association’s activities every year. 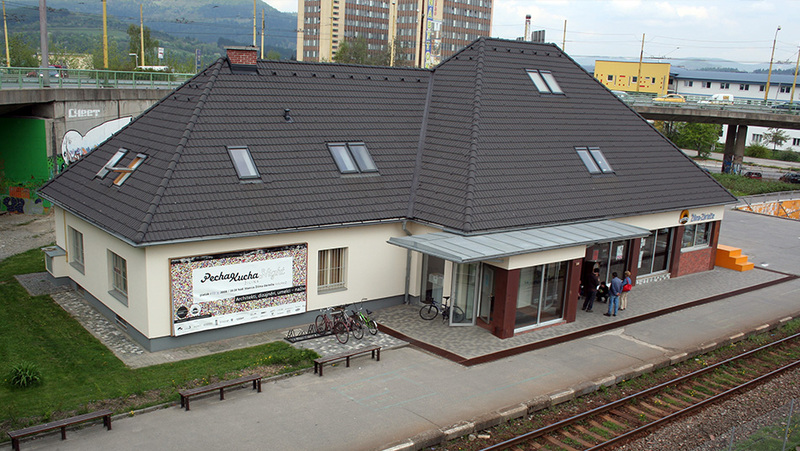 Stanica Cultural Centre is based in an old train station building, which is still operational, Zilina-Zariecie train station since 2003. The centre combines several functions: independent venue, artistic laboratory and activists’ collective. In 2003, True sphérique opened the cultural centre Stanica in an old train station building (station which, by the way, is still operational). The centre has a gallery, workshop and artists residency studios, a cafe, a waiting-room, and a multifunctional venue for theatre, dance, concerts, discussions and screenings. Besides that, Stanice has an outdoor space which is open to the public. In 2009, True sphérique built the venue S2, an alternative construction made out of beer crates and straw bales. And in 2011, the association started the renovation of a new venue called the New Synagogue, designed by the famous architect Peter Behrens. True sphérique is a platform for research and realization of experimental art, cultural and community projects and international and inter-sector communication. Stanica is a member of Trans Europe Halles. The main role of Truc sphérique is to participate in the research and Catalyst programme of the project.